2019 Jeep Pickup Spied - Diesel-Powered Rubicon Edition? One of the most speculated products in years is now a reality. The mid-size truck market is an interesting place these days with a variety of different interpretations of what consumers are truly looking for. For example, the Honda Ridgeline is basically an SUV with a bed. The GM Twins are a mix of a SUV and more truck-features like a steel bed (vs. the composite bed of the Ridgeline). Then, you have the outdated Nissan Frontier which continues to sell really well despite being the oldest truck on the market. Then you have new entries on their way. While the Chevy Colorado ZR2 also was recently spied testing, this article will focus on the upcoming Jeep Pickup currently thought of as a 2019 model. Both the Colorado and Jeep Pickup will likely fall on the off-road range of offerings along with the Toyota Tacoma. The 2019 Jeep Pickup will garner quite a bit of attention prior to its launch. What Do We Know About 2019 Jeep Pickup? 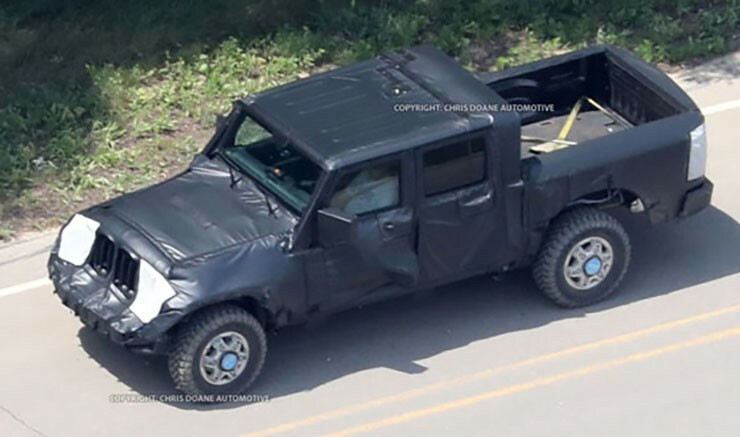 “After years of anguished deliberation, Jeep is now moving forward with a Wrangler-based pickup truck, and we’ve finally spied Fiat Chrysler Automobiles’ engineers testing just that. “Jeep hasn’t a pickup since the Comanche ended its run in 1992. 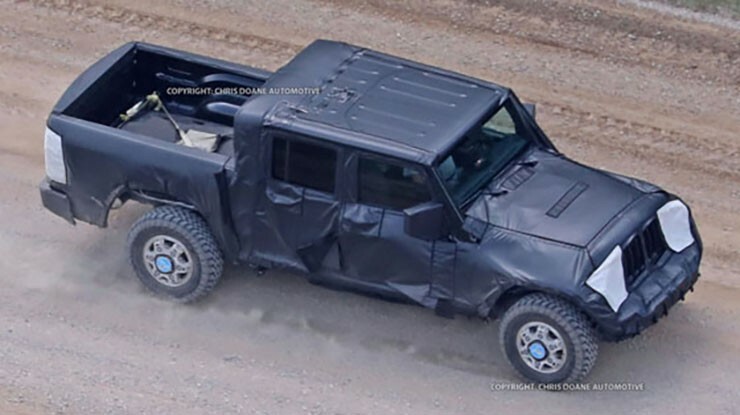 Since then, Chrysler and FCA have floated the idea of a Wrangler pickup with the Gladiator concept in 2005 and the J-12 Concept at the 2012 Moab Easter Jeep Safari. “The prototype in our photos uses the four-door Unlimited body style with a fairly sizable pickup bed. That said, looking at the placement of the rear wheels in the wheel well, we’re pretty sure this probably isn’t the final bed design. “We can also see some seriously aggressively treaded off-road-ready tires on this test car. “Code named ‘JL,’ the regular 2018 Wrangler will start production in the fourth quarter of 2017. The Wrangler pickup, code named ‘JT,’ will go into production in the third or fourth quarter of 2018, making the pickup a 2019 model-year vehicle. Both will be built at the Toledo, Ohio, plant. “The entire Wrangler lineup will be riding on a new chassis and feature more weight-saving materials — it’s been reported there will be only limited use of aluminum. Diesel powered? Aluminum body panels? Lots to talk about with the 2019 Jeep Pickup. There are several pieces here to ponder and how they will impact future generations of the Tacoma. For starters, the use of aluminum is interesting and likely is a nod to fuel economy. The straight-axle Jeep Wrangler has had sub-par fuel economy numbers for decades and with new CAFE regulations plus higher fines for not making fuel economy targets, Jeep is likely going to have to either drop the axles or find other ways to cut weight. Aluminum, lighter than steel, is a good way to drop weight without sacrificing capability. Next, you have the rumor of a 2.0L turbo-charged inline four-cylinder engine. This will likely be a smaller version of the current 3.0L EcoDiesel produced by VM Motori in Italy. With Fiat having a controlling stake in that company, it is a safe bet they would outsource the engine to them. One would also expect a V6 Pentastar engine will make its way into the truck. These engines will be paired with an 8- or 9-speed transmission to further help improve the fuel economy numbers. While fuel economy is a key, off-road capability will also be a focus. One has to expect Jeep to incorporate many of the Jeep’s Active Drive, Command Trac 4×4 or Rock-Trac 4×4 systems. It just depends on how Jeep sees the truck buyers needs. For example, the Active Drive system, used in many of the uni-body SUV vehicles like the Cherokee, Patriot and Compass, does an adequate job of handling a variety of terrains with a push-button terrain select feature. It is akin to the auto-AWD system found in the GMC Canyon as well as the Multi-Terrain Select System found in the Tacoma. The bigger unknown for the Jeep pickup is going to be just how far Jeep is going to push the envelope on off-road capability. The big question here is: Will there be a Rubicon model? Will Jeep offer a pickup with all that off-road capability? Following the market for the past several years and understanding how much profit there is in higher-trim model offerings, the business case for building such a truck makes a lot of sense in future iterations. It is likely the first launch of the truck will be base models with an entry-level off-road truck. Then, as the market responds and Jeep measures reactions, they will have a big decision on whether to build a Rubicon edition. If Jeep decides to build such a truck, it will be a serious competitor to the Toyota Tacoma since it will match all of the 2017 Toyota Tacoma TRD PRO off-road capability, offer a diesel engine variant and look just as rugged as the Tacoma. While the Tacoma will still have its superior reliability, the diesel-engine offering will surely attract attention. However, with diesel engines historically being $3k more than gasoline models, the current thinking is most consumers will not want to pay that high price. It is anyone’s guess though really. Years ago consumers wouldn’t pay more than $30k for a mid-size truck and now we have GMC Canyon Denali coming that will top $50k. At the end of the day, this is simply a big gamble for Jeep. Who knows if the mid-size market is large enough for all of these competitors and can it really compete with the Tacoma. One thing is for sure, as King of the Mid-Size truck market, Toyota isn’t looking to lose its grip on the market and more competition is good for consumers.